You can operate an account with as little as $10 and you can stake as little as $1 per trade with no charges or commissions on your trades and withdrawals. MarketsWorld pays out returns up to 90% per winning trade. You can withdraw your funds including earnings any time with no transaction fees. This broker is licensed and regulated in the Isle of Man, Great Britain, a respected and trusted legal jurisdiction. You can make hundreds of trades for as little as $1 each without fees, commissions, margins, or spreads. MarketsWorld offers a range of promotions and offers to keep you interested. MarketsWorld offers 24/7 customer support. It's important to realize that virtually no service in the Binary Options Brokers category will be an ideal solution that can match all the requirements of different investors. It may be a good idea to read a few MarketsWorld reviews first as specific solutions may actually perform well exclusively in a specific geography or situation or be designed with a very specific customer in mind. Others can work with an idea of being easy and intuitive and as a result lack complex functions needed by more experienced users. You can also find services that cater to a large group of customers and give you a rich feature set, however this in most cases comes at a more expensive cost of such a service. Ensure you're aware of your needs so that you get a service that provides all the functionalities you search for. We realize that when you make a decision to buy Binary Options Brokers it’s important not only to see how experts evaluate it in their reviews, but also to find out if the real people and companies that buy it are actually satisfied with the product. That’s why we’ve created our behavior-based Customer Satisfaction Algorithm™ that gathers customer reviews, comments and MarketsWorld reviews across a wide range of social media sites. The data is then presented in an easy to digest form showing how many people had positive and negative experience with MarketsWorld. With that information at hand you should be equipped to make an informed buying decision that you won’t regret. What Bonus Does MarketsWorld Offer? 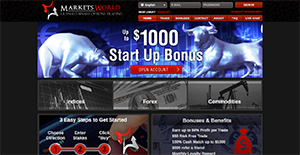 While MarketsWorld is still a new player in the binary trading industry, it has earned positive praises for its series of excellent features and user-friendliness as well as great features such as high payout, low deposit requirements, and quick cash out processing. MarketsWorld is subject to the UK courts of law, under the Isle of Man GSC, and is a regulated trading entity. If you need more information about MarketsWorld or you simply have a question let us know what you need and we’ll forward your request directly to the vendor.